In 1927/28, at the age of 21, Anton Stankowski starts to create factual-functional montages of typography and photography in constructive arrangements for advertising purposes. Right from the beginning, he makes use of the points of view of photography which were new at the time, and he belongs to the pioneers of “new seeing”. In his designs for packages, leaflets and advertisements for the grocery chain “Hill”, in 1929, he brings in Akzidenz-Grotesque as a standard type, thus decisively contributing to the successful rediscovery of this factual printing letter type. At the same time, he makes innovative designs for the office furniture manufacturer “Fortschritt”, e.g. letterpaper anticipating the employ of white spaces taken up in commercial art work after World War II. 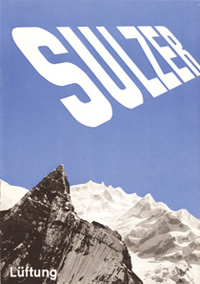 At the end of 1929, Stankowski starts to work for the advertising agency of Max Dalang in Zurich, where he becomes the actual stimulator and first practitioner of the factual Swiss commodity design. The serial and precisely calculated shapes developed by Stankowski in Zurich until 1934 for advertising and informational purposes also influence constructive and concrete art, which whose protagonists in Zurich, Richard Paul Lohse and Max Bill, Stankowski has manifold connections. He remains an uncompromising factual and modern designer after his return to Germany in 1934 employing, for example, photograms in the design of pod packages in 1938. In his postwar works, Stankowski expands functional design into visual communication. Numerous word and picture marks are developed in the greater context of corporate identities. In the middle of the fifties, the graphic artist Anton Stankowski becomes a studio director, his large order book requires an increase of manpower. However, it is not a boost in quantity which Stankowski intends, but in quality: consequently his “Viessmann” word mark in 1965 starts the first corporate design project for capital goods, which will determine the whole field in an international context. With an equally great influence on worldwide graphic communication follows the development of the Berlin layout (presented in 1968) as a complex system of public graphic design. In 1972, Karl Duschek joins the studio as a staff member, at first. In him Stankowski finds the ideal partner for large tasks, such as the development of the corporate identity of the Deutsche Bank, which Duschek outlines according to Stankowski’s signet draft in 1974 and realizes in the studio. This mark has an exemplary effect for the financial service segment and has found numerous imitators worldwide. The publication of the works by Anton Stankowski is only allowed with permission of the Stankowski-Foundation © Stankowski-Stiftung.